Grab an empty tube – it’s color matching time! Currency is a big thing in toddler life. You know, figuring out what they’ll work for, what makes them tick, and what they really love… for my daughter: it’s dot stickers. I know you’re laughing but believe me, it’s true. Dot stickers are our jam around here. 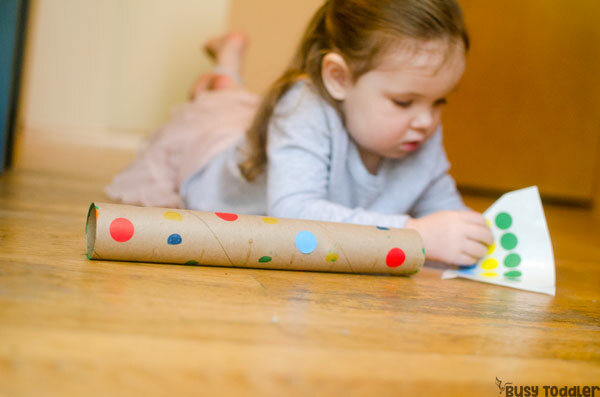 We love using them in any activity we can think of – they’re one of our favorite supplies. 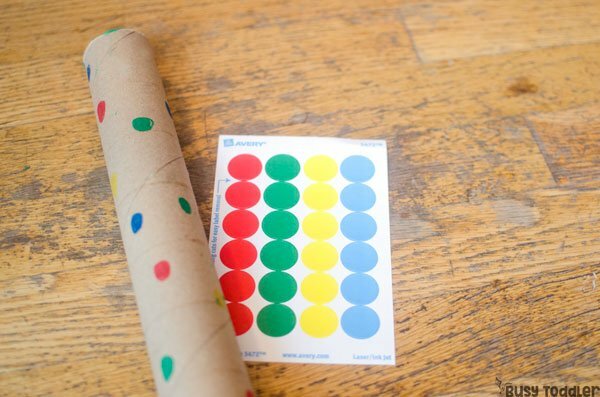 So grab your dot stickers – here’s one easy color matching activity! 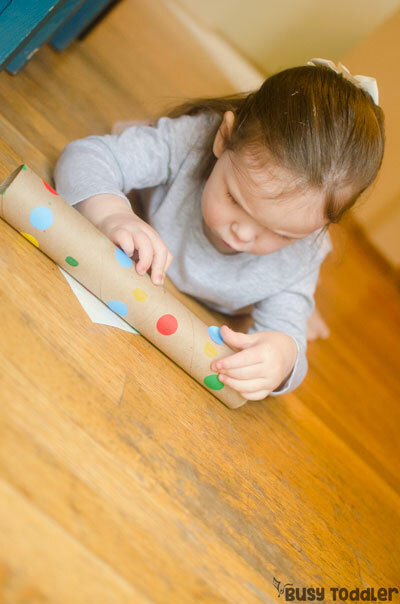 Check out And Next Comes L’s Matching Pole post for a reading twist on this activity idea. 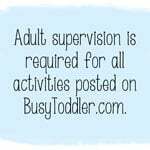 You don’t need much for this easy activity! This activity took me about a hot second to set up. It took no time at all. 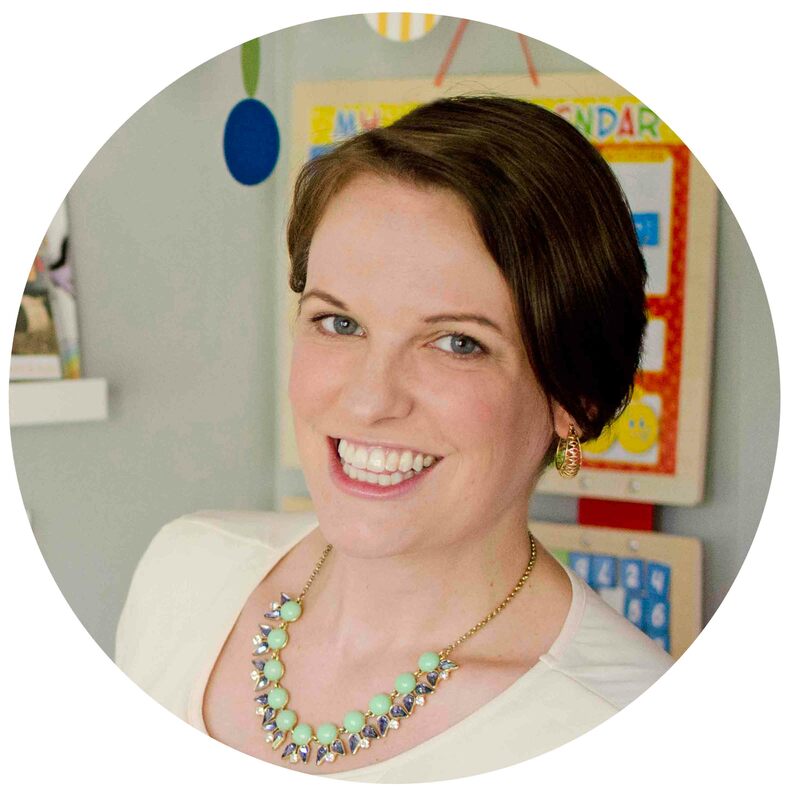 Don’t let prep time be the reason you skip toddler activities. 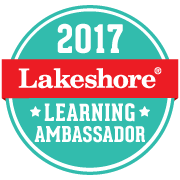 Quick, low-prep activities are out there (trust me – I know and love them). I grabbed my paper towel tube and markers. Since each sheet has 6 dots per color that’s how many dots I made on my tube: 6 red dots, 6 blue dots, you get the idea. Twenty four dots on the tube for my 29 month old and she was in heaven. She got all comfy, cozy on the floor and went right to work. I love activities like this because they pack quite a learning punch. First of all, it’s crazy easy to set up and held my daughter’s attention for almost 10 minutes. 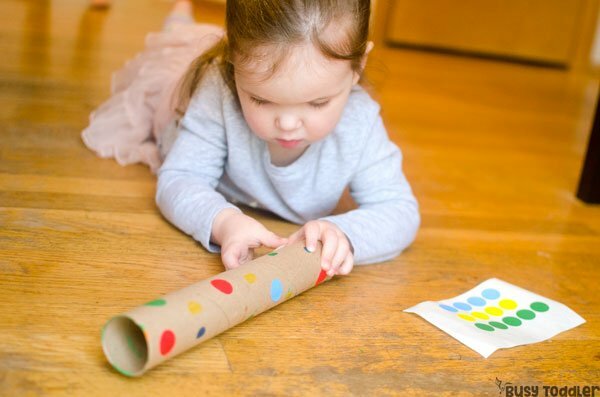 Simple activities like this aren’t always as “simple” as they seem. 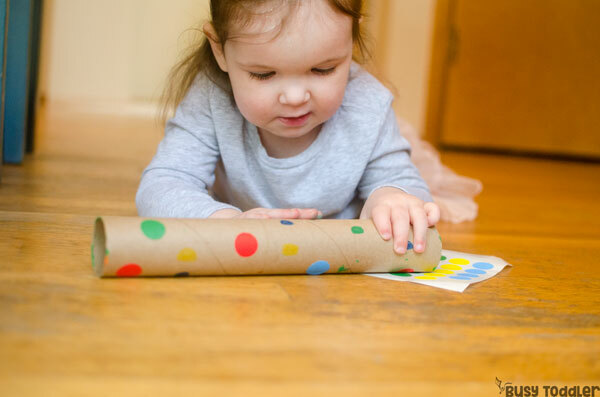 Even something small like dot stickers and a paper tube can be insanely complex in the toddler world. 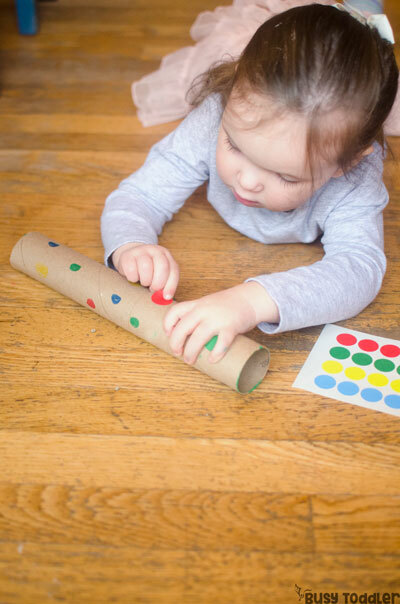 This easy color matching activity is perfect to pack with you. Can’t you just see your toddler playing with this on an airplane or a long car ride? I might even add a version of this to my restaurant kit – it’s a great quiet, independent activity. 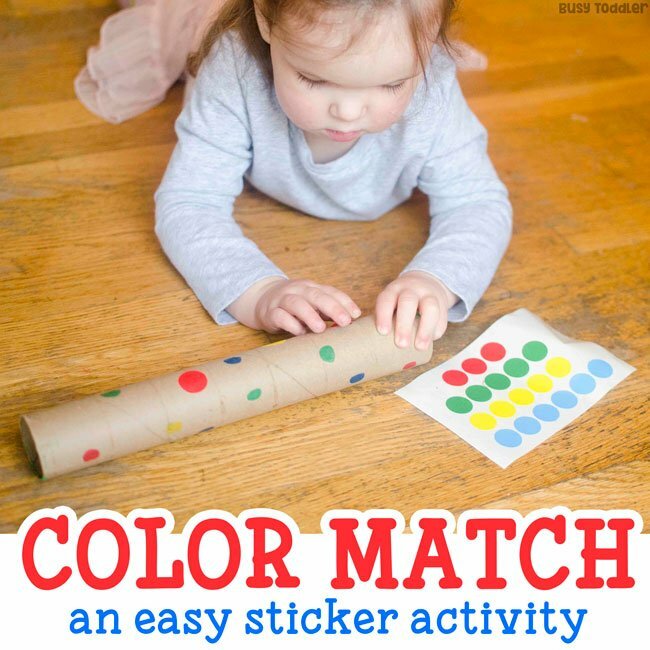 Playing this easy color matching activity with my daughter was a terrific way to spend some time together. 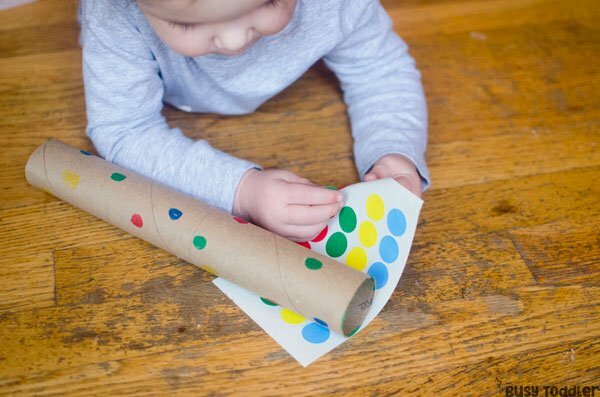 Grab some dot stickers and an old tube and make something similar for your toddler. 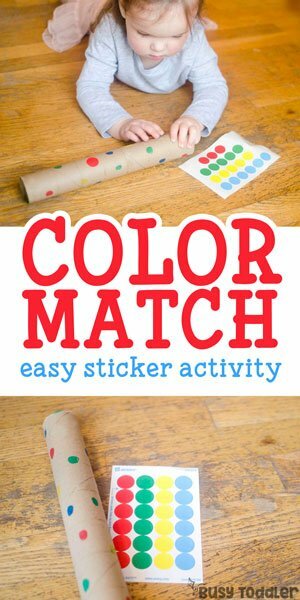 Will you try this easy color matching activity?